The growing population of India has created many problems – one of the challenging ones being car parking which we confront almost every day. Besides the problem of space for cars moving on the road, greater is the problem of space for a parked vehicle considering that private vehicles remain parked for most of their time. Roads are being built for cars to ply but are we also giving the vehicles enough space to park? While residential projects still escape with designated parking, the real problem lie with commercial spaces – many a time which is overcome by taking extra open spaces to park. Multi-level Parking systems for sometime have provided relief since they come with a number of advantages – optimal utilisation of space, lower maintenance and operational cost, lower construction cost (owing to the prefabrication), secure and environment-friendly nature (the underground implementation renders the outdoor space free for landscaping), comfortable for the drivers, cost saving for builders by saving height or depth. It might be interesting to note here that the earliest known multi-storey parking was built in 1918 in Chicago. Automated Car Parking Systems are much in vogue – a method of automatically parking and retrieving cars that typically use a system of pallets and lifts and signalling devices for retrieval. They serve advantages like safety, saving of space, time and fuel (since one does not have to drive around for locating space) but also need to have an extra and a very detailed assessment of the parking required, space availability and traffic flow. These can be further categorised into fully automatic or semi-automatic systems. TAL Manufacturing Solutions Ltd has introduced state-of-the-art Fork type design tower parking system – the TAL Vertipark tower (with an impressive stand-alone steel structure) with an average retrieval time corresponding to 1min for 20 cars and 90 seconds for 40 cars. Dwelling on the advantages Das says, “The retrieval time is less, cost is reachable to a common man and environment-friendly since it occupies the space of only three cars on ground and can accommodate upto 40 cars. All the cars can be stored using access cards or password which reduces mischief and theft of cars.” Other advantages include a shorter construction time; no costly concrete repairs / maintenance and lower liability insurance. The driving of vehicles at only one level make it preferable to be used in the automobile industry too. The entire system can be manually operated with individual controls. 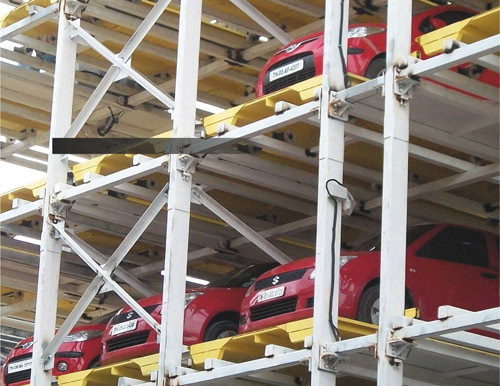 Parked vehicles can be retrieved during repair also which as Das points out is not the case with pallet systems in which parked vehicles can be manually retrieved only after the completion of the repair of the system. PARI’s Tower Square Type Parking System (designed with pallets or without pallets) preferable for 30 to 40 cars features a lift which is electromechanically operated. At the loading point, the lift receives the car and then travels to the respective location of the parking slot. Their Tower- Rotary Type Parking System preferable for 8 to 12 cars features a rotary mechanism that allows the system and all the cars to travel in rotary motion at the space of 2 cars. Govind Oza, Director, PARI counts fully automatic Chess Parking system as a futuristic parking system. Talking about this system which is provided by PARI, he adds, “This system ensures maximum utilization of the floor space without the need of drive ways, and space for movement of mechanisms. This has floor mounted roller bed system which can allow the crisscross movement of the pallet and the car. It has separate lifts which act as entry & exit points.” Preferably installed on RCC floors, it can be designed for 800 to 1000 cars or even more and can be used in longitudinal & square areas. RR Parkon’s turn table system allows the car’s direction to be easily changed by any angle to drive out as required. The system helps a car turn 360 degree and requires a space of just 5 meters to turn the car. It is available in either stand alone types or built in types. At RR Parkon, Car Lifts are available – both hydraulic as well as traction type. All the functions are fully computerised and capacities of 2, 2.5 and 3 tonnes are available. Available at RR Parkon, this system consists of three spaces – top, middle and bottom which are united and lifted together. While the middle and bottom spaces are underground in the pit, the top level is in the same line with the ground floor parking. Advantages include saving land area, low noise, easy maintenance and protection of the middle and bottom level from dust, rain and theft. Tal Manufacturing Solutions Ltd provides free warranty service for one year. Post warranty, there is an annual Maintenance contract (AMC) entered with the customer for providing round the clock service. Their service personnel attend to emergencies immediately after registering the service complaint. At PARI, Govind affirms, “There are regionally located service centres in all metro cities of India. Engineers are available on call basis and PARI takes even AMC for the projects which are installed by PARI.” At Dantal as Sanjeev adds, AMC (comprehensive and non- comprehensive) is provided and sometimes O&M contracts are also taken. With the rising population and the number of cars, more intelligent ways need to be devised to combat the present problems. Indraneel strongly feels that we need to ban parking in all central area roads and old areas of cities where there is no ample road width. Simultaneously, we have to provide for public parking lots and MLCP’s at competitive prices. Sanjeev is of the view that inspite of uncertainties in the market place, simple 2 levels Stack/Dependent parking will be ideal in most cases. Das foresees tower parking systems as the best solution in the present day scenario for multi-storied buildings due to their unique feature of increasing the parking space by 17 times. He adds, “Since the towers can be built-in the buildings, no extra space is required. The towers have user-friendly HMI (Human Machine Interface) systems which guide the user while storing and parking the cars. Since there is no dependency of cars, this solution is becoming more acceptable to the customers.” Looking towards the future, Puri feels that though in immediate context the automatic car parking systems would help ease of congestion traffic, however future interventions need to be explored to minimize the involvement of human element for loading and unloading during parking process, involved in semi-automated car parking systems. To protect car parking areas from extreme temperature, UV exposure, heavy rains and high humidity, high performance deck coatings are used. Flowcrete India Pvt Ltd, fully owned subsidiary of Flowcrete UK Ltd, a leading specialist Flooring company has the Deckshield system. Deckshield ED (for external decks) consists of a flexible polyurethane car park deck coating system which is hardwearing, waterproof, reduces noise and has crack bridging properties. The only system of its kind that adheres to the stringent American standing testing specification ASTM C957, Deckshield comes in a number of colours and finishes and its light reflective property helps in creating a brighter ambience. It has added advantages like fast installation (vehicular traffic-24 hours), easy maintenance (general mopping and hosing), excellent anti slip profile, highly accredited fire rating and can be over coated with same material with full intercoat adhesion. Deckshield ID (for interior decks) is a Green Label certified, Low VOC, flexible polyurethane car park deck coating system providing a colourful, watertight, hard wearing material for intermediate decks of multi-storey, basement and other trafficable suspended floors. Srinivasan V, National Sales Manager (India) of the firm adds, “In our after sales, we submit a warrantee for 5 to 10 years depending on the project against de-bonding, and fading of colours. Our system has elongation property of 60% hence to ease traffic congestion in India the system we specify should be able to cater the loads and flexibility in MLCP”.